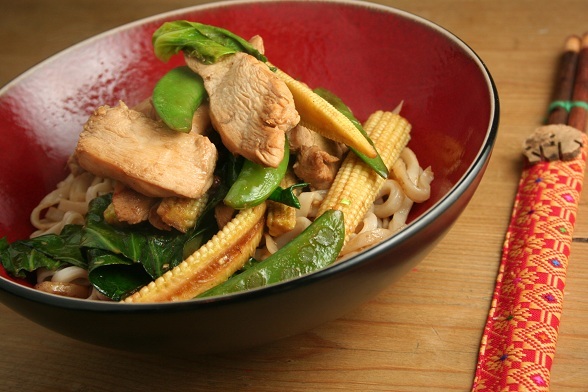 When we fancy a stir fry of some sort we usually end up following a Thai recipe or at least giving it a Thai twist, but this time we fancied something in a Chinese style instead. We had intended to use oyster sauce but when it came to cooking time we found that we didn’t have any. Problem. And we thought of using chilli flakes but we found that we had none of those either. Another problem. But we ended up using Szechuan peppercorns instead; Szechuan peppercorns are brilliant and if we’d remembered that we had them then we probably would have planned to use them anyway. So we forged ahead and just added loads of soy sauce in an attempt to make up for the lack of oyster sauce… it worked out pretty well. Place the thinly sliced chicken breasts into a bowl and add 2 tablespoons of soy sauce along with the szechuan peppercorns and one third of the garlic. Stir and let it marinate for 30 minutes. Then heat up your wok and add a little oil. When it is hot, add the garlic for 30 seconds and then add the chicken (leave excess marinade behind in the bowl for now), stirring constantly while it fries. After 2 to 3 minutes it should be almost cooked; remove it to a plate. Add a little more oil and another third of the garlic. After 30 seconds add the baby corn, mange tout and spring onions. Add a splash of soy sauce and stir fry for two minutes, adding the spring greens or pak choi half way through. Then add the chicken back to the wok along with the reserved marinade and a splash of the Chinese cooking wine and turn down the heat. Stir well then cover the wok with a large saucepan lid and leave it for 2 to 3 minutes. Then it should all be cooked, so remove it to a plate, preferably a warmed one so that it doesn’t get cold. Turn the heat back up and add a little more oil and then the last of the garlic. After 30 seconds add the noodles and a generous splash of soy sauce; stir fry for 2 minutes or until done. Serve the noodles with the chicken and vegetables on top of it. Enjoy!